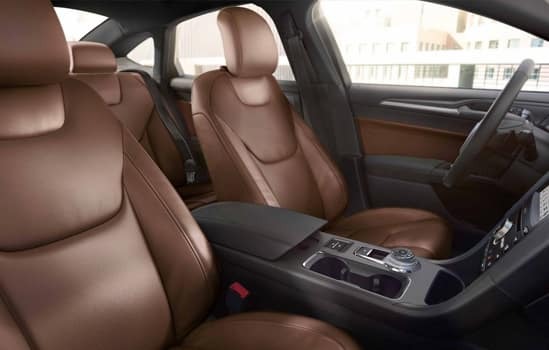 The available cooled driver and passenger sears and an available heated leather-wrapped steering wheel offer comfort and convenience right where you need them, while new interior color choices like Light Putty with Bold Brown and Russet, add to the overall style. 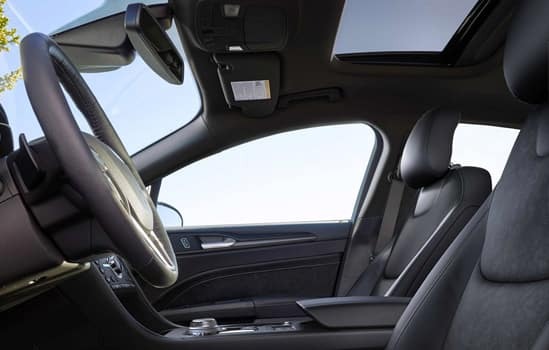 A rotary gear shift dial leaves space for cupholders and a USB port – taking up less room than a traditional shifter – and provides the convenience of space to an intuitive and insightful interior design. 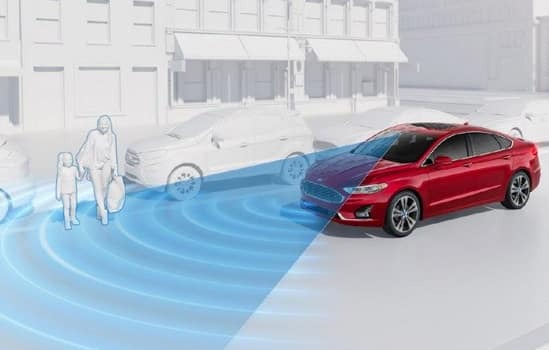 Take smart on the road with the available Pre-Collision Assist with Pedestrian Detection. 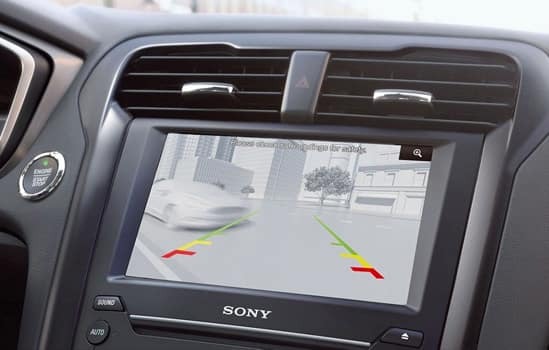 If the system’s sensors detect a potential collision with a car or pedestrian in front of you, a warning flashes on the windshield and an alert sounds. Also, the brakes will precharge and increase brake-assist sensitivity to provide full responsiveness when you do brake. If the driver does not take corrective action and collision is imminent, brakes can apply automatically. When in cruise mode, a radar sensor detects traffic slowing ahead and can automatically brake and accelerate to help keep you moving with the pace of traffic. A camera mounted behind the windshield scans road lane markings to determine vehicle position and detect a lane departure. Available cross-traffic alert uses radar to sense traffic behind your vehicle when you’re slowly backing out of a parking spot or your driveway. 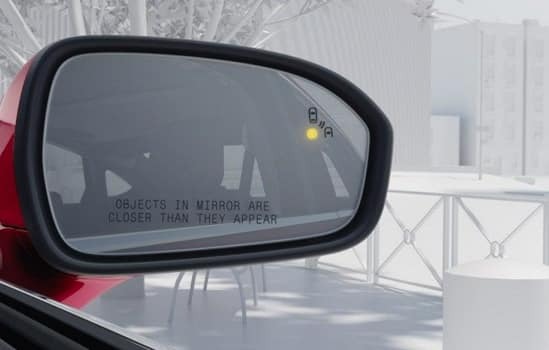 If cross-traffic alert sensors detect a vehicle approaching from up to 15 yards away, you will be alerted by a visual display in the corresponding mirror and a signal in the message center. You will receive an audible alert as well. Cross-traffic alert comes with BLIS® (Blind Spot Information System). 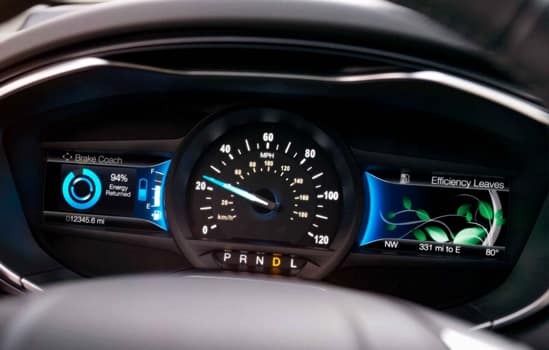 The dual LCD SmartGauge with EcoGuide provides real-time information to help you enhance the efficiency of your Fusion Hybrid or Fusion Energi plug-in hybrid. MyView lets you customize screens. Configurable screens such as Brake Coach help you maximize your vehicle’s efficiency. Left-side display screens include Engage and Empower modes. 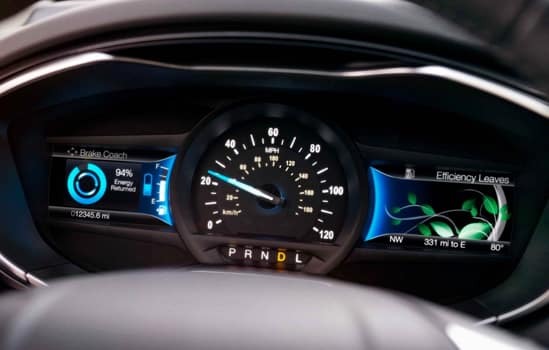 In Engage, you’ll see separate gauges for engine power and lithium-ion battery power. In Empower, which includes all the information in Engage, you’ll also see how close you are to the gasoline engine on/off threshold and the amount of power being requested based on how far you’re depressing the accelerator pedal. SYNC® 3 is our easy-to-use, responsive voice-activated technology. Experience the capacitive touchscreen with impressive responsiveness. Locate your favorite restaurants with simple destination entry via the available navigation. You’ll also find a sleek user-friendly interface to help you connect to and control your smartphone. 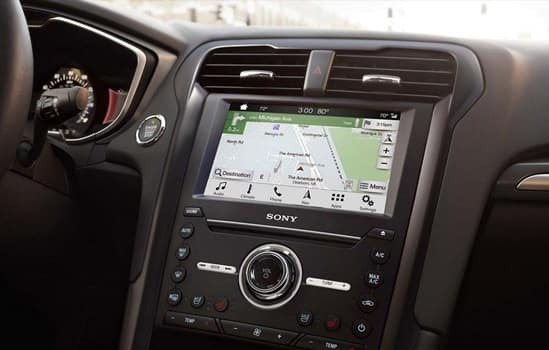 SYNC 3 also brings you the power of Apple CarPlay and Android Auto compatibility to your Ford. Enjoy more than 150 channels including commercial-free music, plus live sports, news and exclusive entertainment. You’ll hear every channel available, plus you can listen online and on the SiriusXM app. Includes a five-year complimentary SiriusXM Traffic and SiriusXM Travel Link trial subscription. Global Positioning System (GPS) technology is combined with 3-D mapping and provides voice-guided turn-by-turn directions. With SiriusXM Traffic and Travel Link, you’ll get detailed traffic information, along with current and forecast weather, gas station locations and prices. 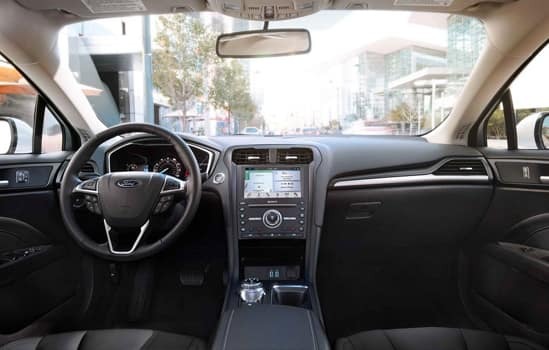 The 2019 Fusion has three EcoBoost engines to choose from: the 1.5L, standard on SE and SEL, the 2.0L, available on the SE and SEL and standard on the Titanium and the Fusion V6 Sport with the 2.7L V6. All three combine turbocharging, direct injection and twin independent variable cam timing. Even with vehicles outside of its own class, V6 Sport is still part of the conversation within the circle of European performance. 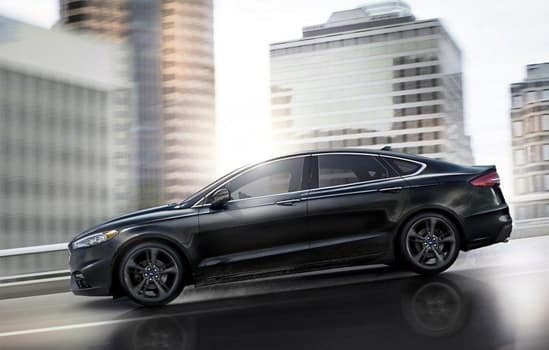 The Fusion V6 Sport has a powerful 2.7L turbocharged EcoBoost® engine that kicks out 325 horsepower which is best in class, with 380 lb.-ft. of torque* and standard AWD. Continuously controlled damping (CCD) uses an advanced suite of sensors to constantly monitor the vehicle’s suspension motion, body movement, steering and braking to adjust the suspension damping in milliseconds to help keep the body of the vehicle quiet and smoothly on track. 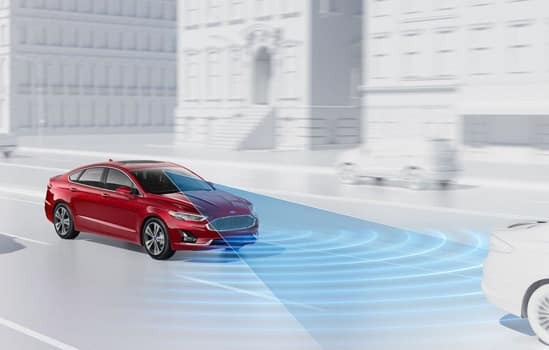 Fusion V6 Sport also has a pothole mitigation system within its standard CCD suspension, which can provide some protection against jarring impact and costly wheel and tire repairs. Intelligent AWD sensors balance torque between the front and rear wheels to enhance handling and maximize traction, typically before wheel slip can occur. AWD is available on SE, SEL and Titanium. 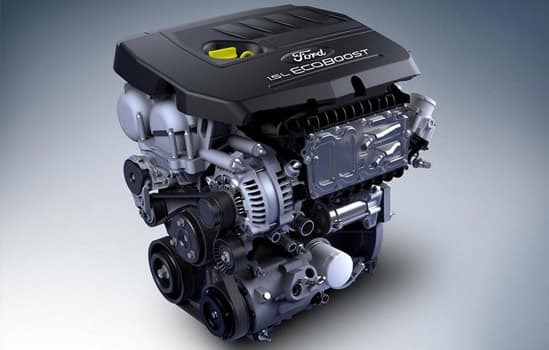 It’s standard on V6 Sport with the 2.7L EcoBoost® engine. Not available on the Fusion Hybrid and the Fusion Energi plug-in hybrid. You can help reduce vehicle emissions with available Auto Start-Stop Technology. When the vehicle comes to a stop in city driving, the engine is automatically shut off. The air conditioning and radio stay on, keeping you comfortable. The engine seamlessly restarts when your foot leaves the brake pedal. Standard on the 1.5L EcoBoost® engine. Say hello to the next generation car buying experience! At Port Orchard Ford, we keep things simple, quick, transparent and hassle-free. Our specially-trained “Car Guides” listen to you to find you the perfect vehicle at the best price. With hundreds of vehicles to choose from, you are sure to find exactly what you’re looking for. Shop at your convenience on our comprehensive website for new and pre-owned vehicles, current specials, and compare bank offers in real time to customize your monthly payment, get instant trade-in estimates, even get pre-approved….all from the comfort of your home computer or mobile device. From Sales to Service, Bruce Titus Automotive Group has been proudly serving the Puget Sound Regions since 1995. We have a long history of community involvement, serving organizations that benefit our neighbors and neighborhoods. Come in for a test drive and mention the Bruce Titus Pet Project and we will donate $25 to the local Humane Society. Our commitment does not end when you purchase your vehicle. Our highly factory-trained technicians and transparent service department will keep your vehicle running at optimal performance for safety, longevity and enjoyment. You can also enjoy FREE car washes for the entire time you own your vehicle! We invite you to come in and experience a car shopping, buying, and owning experience that is all about you! Take a test drive and let one of our Car Guides help you find the vehicle that fits your budget and lifestyle. It’s that easy. If you have any questions or would like to make an appointment, please give us a call at 360-876-3000. We look forward to serving you!